Note about review --- This review is the sole opinion of an E-Commerce geek who’s been in the business since 1998. The author is not affiliated with nor conducts business with the shops reviewed here. If this review is exposed to the elements or your boss, then you risk bodily harm and or physical injury due to your manager breaking your bones with excitement after your conversion rate increases 3X or new visitors grow by 100%. Please take this review seriously and do not attempt recreating the recommendations listed in this review unless you are a professional or have professional guidance. According to Archive.org, RepublicBike.com has been around for 5 years. They first appeared January 4th, 2009. Navigation on Republic Bike is as simple as it gets. Top-level navigation is organized in a unique way. Instead of just listing About / Faqs / Gallery / 3D Bike Shop / Press / Corporate & Retail / Cart as tabs, Republic Bike uses colors and imagery from the logo to draw the user's eye to different areas of the top-level navigation. I get the funny feeling that whoever designed the navigation wanted me to click on 3D Bike Shop, Corporate & Retail, and the Cart. It's a great example of using color or re-using similar colors to draw the eye to the important areas of the site. Red is powerful color. Check all major retailers, and the price is red. That's no accident. It's a proven design metaphor that's simple and just works. I'm guessing the 3D Bike Shop, Corporate and Retail, and the Cart features are the major performers for Republic Bike, too. Ironically, while I was preparing this report, Republic Bike actually changed their main navigation header. I was confused at first, but then realized they pushed changes to the site as I was evaluating it. How cool is that? Iterate baby! It's scary to make top-level navigation changes. Traffic could tumble. Congratulations on having the courage to make the change. Let's analyze the subtle differences. Here's the new top-level navigation. It's clear now the Custom Bike Shop area of the top-level navigation is the main emphasis. Look at the box around it. In the top-right corner, they added social proof in the form of Facebook followers. Well done Republic Bike. Would love to know if the amount of visitors who converted increased after this change was made. Also included in the change, after a user mouses-over the Customer Bike Shop, a drop-down sub-navigation menu which shows illustrations of the bike so I can choose a bike for my needs quickly, the first time. Again, nice job Republic Bike. If you notice in the top-left, right below the logo, there's the 3D Bike Shop terminology again. Maybe a little testing is going on. Which link drives more customers to the "bike builder" page? Do tell Republic Bike. Inquiring minds would like to know. Before I go on to the Custom Bike Shop, I traveled around the site and found the press page. If I would have designed the page, it would have been boring, tabular format and would probably have a huge bounce rate. Whoever designed Republic Bike's press page needs to be congratulated! All I can say is WOW! I wanted to keep scrolling down the page because the format was broken-up and kept me on the edge of my seat. Here's a sample. Text, magazine cover, video, etc. The media on the page felt like a bunch of magazine clippings strewn about a coffee table. For a brief moment, I forgot I was online, in a browser, touring a website. At the top of the Press page is a major press release disguised as an advertisement. Republic Bike outfitted Google with a fleet of crazy-colored bikes so Googlers can get around the sprawling Google Mountain View campus while burning a few calories. Here are the two Google ads (PR) Republic Bike Shows. Your's truly at the GooglePlex for a Think Shopper event in 2012. Yes, I've seen the yellow, green, blue, and red bikes all over campus. There must be hundreds of them. One thing is certain. Republic Bike is not like every other E-Commerce retailer. They threw out the conventional and did it their way. Not every shop online has ingenious press release content disguised as ads or includes a user-submitted photo gallery page for example. Typically, a user would click on category navigation, then select a category, get faceted navigation, a product grid with quick views, and product page links all over. Not on RepublicBike.com. It's a visual experience like no other. That was refreshing to me. Here's a sample category page. I really don't care the black and white bike, first row second one from the left, has a funny wheel or got cropped by an intern. I love looking at the imagery. Below the impressive visuals of all the different bikes, is photo collage of customer submitted photos. Again, this could have been "just another gallery," but the layout is fun and playful. See for yourself. Feels like photos on a coffee table. I found the product page for the Plato Step Thru bike. See below. Republic Bike does not let you get too far from the notion of customizing your bike. You can even create a random bike or select from popular builds. Nice touch. As I sit on the page and read the content, my eye is focused on the shifting frame, chain case, grip, saddle, tires, skirt, bell, and housing colors, sizes, and shapes that are constantly rotating independently of each other. There was a lot of painstaking graphic design work to make this page "come to life." I'm impressed by their efforts even though I'm a bit dizzy from how fast the content is rotating. Could you slow it down a bit. Right below the customization section on the page, is a banner which I would call the conversion maximizer. If you sell a product, and it's made in the USA, why not list that in BIG BOLD LETTERS on your product pages? Republic Bike thumbs its nose to the norm again by using design elements from the logo and colors to decorate the fact Republic Bikes are "Assembled In The USA." Where are the parts made Republic Bike - China? At this point - I don't care. I see USA and want to buy. Republic Bike sets an expectation with customers how long it will take to get one of these bikes. 7 business days for the Plato Step-Thru. But because that is listed in the Made-In-USA section - I don't care. All I see is America! Win! Directly below the "Assembled In The USA" section, includes all the bike details. Very small font and technical specs are also listed here. Again, the number of days to create this bike is clearly listed with the price - in black not red. Since red and black are the only colors Republic Bike uses, using red for the price might not be the best option. So instead, they choose to increase the font and make the price the dominate item on the page. Nice work. I love assisted navigation. Ever heard of it? I think it's the wave of the future. In fact, here on CPC Strategy and here on Quora, it was mentioned in the context of UX Design as the future of E-Commerce. Think of assisted navigation as a personal butler who assists with every unique customer in a personal way. Yoyo’s Toy Finder, Target’s Gift Finder, and the JustBats Bat Coach are examples of pages setup to assist the customer in navigating to products they have a higher probability of purchasing. It’s not new, but very effective and there needs to be more of this. In fact, Republic Bike was selected by me because of the Custom Bike Shop tool they've built. I've already made some comments about the speed of the content rotation when customizing a bike, but I'll dig-in more and start with a blank slate then share my experience. Hold on for the ride folks. I navigate to the Republic Bike Aristotle and begin the customization process. This is what I see. I could click the boxes next to each option to see which colors and options exists, but that's boring. I'd rather click on the bike image itself. To my surprise, clicking on the frame worked. It also brings up the color options in a semi-transparent context menu with name and color swatch. Very cool Republic Bike. See below. And after a few minutes of tweaking, here's my super-duper awesome bike! After I add the customer Republic Bike Aristotle to my cart, I'm presented with a standard shopping cart page, but again Republic Bike finds a way to do it their way. This time I was not as excited about the uniqueness. Sometimes, using non-standard design metaphors is confusing and required thinking. There are red buttons and black buttons. Some of them do the same thing, some are unique. It does not feel like there's any rhyme or reason for varying the black and red buttons. Take a look for yourself. Where's the image of my super-duper awesome bike in the cart? Want to see it again, but it's not here. What I like about the cart is the shipment date is estimated. I wish the shipping cost, $59.00, was listed somewhere else on the site so I was not so surprised by the cost. I know shipping a big bicycle might be expensive, but I didn't expect it to cost $59. Call me cheap. It's quite possible it was there and I just missed it, too. There are some other items being up-sold on the cart, but this could be made easier for the customer in my opinion. For example, I would like to add an accessory to the cart without going to the product page for the accessory and adding it. Change the up-selling section from this. To this instead. Simple and easy for the customer. When I head over the the checkout page, I'm presented with the most normal-looking page ever found on RepublicBike. At the top of the page, is the breadcrumb trail for checkout which shows me three steps. Very nice, normal, checkout metaphor. I would like to pay with PayPal but cannot. That would be a cool option to have. The last thing I would like to point out about Republic Bike is My Republic. See below. Republic Bike is turning its customers into a marketing team. Look at all this user-generated content Republic is getting just by asking for it. I would like to see these photos on the product page in the form of "action shots" or some way I can see customer using the product. The gallery is cool but I think the images would be powerful conversion agents for the product page. First thing I noticed as I looked for the social links on the site is that they were missing. Then, I realized I was on secure.republicbike.com still looking at my shopping cart from the previous steps. Once I clicked the logo and was taken back to RepublicBike.com, and scrolled down, I saw the social links. These were share links, which required login. On the gallery page, there are links to Republic Bike's social properties which don't require login. WooHoo. I found them. I would make the footer on secure.republicbike.com the same as the footer on republicbike.com. When I click on the social icons, I was not taken to their Facebook or Twitter accounts, but was asked to login to those services and share from RepublicBike.com. Not bad, but not really my use case of choice. Here's the Facebook page. Only a few posts in April 2014. Lots of followers, but not a lot of activity here. Daily posting would classify as normal activity. Twitter account exists, but not very active with tweets. The last tweet was 36 days ago. Love the fact the phone number is present in the header on every page. Republic Bike is not hiding from anyone. Love the "Built by us and You" tagline they feature on the site. Gives me the feeling of being involved with a greater deed when I buy a Republic Bike. Finally, to tie it up and put a bow on it. Do you notice the common design elements from the logo used here. Well done! Way to create a great brand experience that builds my curb-appeal-confidence. Feeling like I'm going to have a good experience if I order. On page SEO is better than average. Republic Bike has boilerplate titles. Here's one for example. Republic Bike | About | track bikes, fixed gear bicycles, fixies, Dutch bikes | built by us and you. I would simply change it to About Republic Bike Company. The blog is located in two places. blog.republicbike.com and republicbike.com/blog. I would go with the latter of the two. That way all your SEO eggs are in one domain basket. Using sub-domains spreads the Google Juice instead of stacking it all under your .com. Want to learn about what RepublicBike.com is running on their site? Check out their BuiltWith details. In the last few months, Republic Bike has removed AppNexus, Google Adsense, DoubleClick.net, and the Facebook Exchange FBX. I can only guess these mechanisms were not working for them. When checking the build status of a bike, why not drop the captcha and use information only the customer would know like the combination of order number and billing zip code. Add PayPal to increase conversions. Add Chat so customers can communicate their way. Improve page load speeds. Use Google insights page load speed tool to validate. Keep in touch info from the gallery page should be on the footer page of every page. Since Republic Bike uses AdWords, why not also turn on Google Trusted Stores. With that, Republic Bike's customers will get questionnaires that Google facilitates and captures, processes, and displays the results next to your ads. Having stars and reviews improves CTR. Update Up-sell widget on cart page that can up-sell in-place. Show image of custom bike in cart for extra awesomeness. Add gallery images to product pages as "action shots." No fear! Taking a creative vision (online bike builder) and making it a webpage requires boatloads of trial and error. Don't be afraid to try. KISS - Keep it simple stupid. Some sites have color schemes and graphics that complicate tasks. Show passion for your work. The pages on RepublicBike.com demonstrate, to me, a passionate company centered around creating a great product and delivering a unique customer buying experience. Don't quit. Ask your users for content. Images, text, whatever they will give. Future customers love it. Urban Girl Office Supply Logo. According to Archive.org, UrbanGirl.com has been around for 15 years. However, it did not include any real content until July 18, 2013. The navigation is striking. It’s much different than I normally see. Top-level navigation is like a combination faceted/filter + navigation element all wrapped into one. Notice the shop by color feature below. Below shop by color is shop by situation, which is also a unique approach to navigation. Hovering over each main navigation element produces another selection of sub-categories which are also nicely organized. Clicking on the “Office Fashion” category returns a landing page filled with categories, that I can only assume, include products that are selling well. Below, I can find the product grid of all “Office Fashion” products sorted by default. What does that mean? Selecting the options shows what it’s not, however. There’s a common theme with the landing pages. As I dig deeper into the site categories and click on “Workspace Decor,” I’m shown a consistent-looking page with sub-categories at the top and a products grid with products sorted by default - again. The product grid includes a unique grid-tile. See for yourself. Each grid-tile includes a border to delineate the content. Normal layout, but the “Urban Girl Product Tile” includes a quick add-to-the-cart function that appears in the form of a branded Urban Girl Shopping Bag. The shopping bag is the same one included at the top of the page for the shopping cart. Great way to draw the eye back to the cart with a simple design metaphor. Hover over the shopping bag and get a visual cue there is more. The plus cue insinuates add +1 of this item to the cart from my perspective. Well done. Also, take note of the textured background. Between the header and the products grid is more textured background design. I’m beginning to think this is a site developed by women for women. Oh wait, lookie there at the top of the page. I found the “Urban Loft” desk collection and love the unique format and usability displayed here. I can easily add items to the cart or view details about each one. See image below. Here’s a screenshot for the “ready to buy” section of the product page. Great title, price, availability, photo, enlarged photo, reviews, social sharing, plus many other features screams normal product page. What scares the crap out of me is the image/clip art lady holding a bag. That offers the user no value other than to remind them of what they could look like. I am curious to know if this is the output of an A/B test. She’s got to be there for a reason. Below the ready to buy section of the site is a section for customers who bought this also bought these items. And another section at the very bottom includes items recently flirted with. I’m not sure if this is real or just to be cute. Here’s an example product flirtation. I’ve added two items to my cart and now I’m ready to checkout. I can do so two ways. First way is to click on the cart. Second way is to skip the cart and go directly to checkout page. Nice that both options are available. Looking at the cart, I just happen to select two products from the same category. If you look closely, you can see the product images are not consistent. Not sure if this is on purpose or by accident. I prefer painstaking consistency in E-Commerce photos. It hurts my eyes when similar products are not displayed consistently when I’m shopping. However, looking at them in the cart, hurts less, but still hurts. At the top of the page, in big bold letters, Shopping Bag is listed. Below the cart items, there’s an image of a disk with the words SaveCart all bunched together. One line below, and in the center, is a button labeled “Update Bag.” Is it a cart or a bag? I think bag. PayPal is offered on the cart - great choice. Looking at the checkout section, I see the dreaded promo code box. Everytime I read about promo codes, the pattern is the same. The customer leaves the site and Google’s “company name” promo codes. Eight times out of ten, people get sidetracked and do not come back to complete their order. I would create URL-based promo codes, like if someone goes to http://www.urbangirl.com/promocodes/10%-off which enables 10% off the entire order, then the promo code text box becomes the promo code display area. This way enables promos and reduces abandonment at the same time. UrbanGirl.com offers a one-page checkout and passive account creation. Well-done Urban Girl! 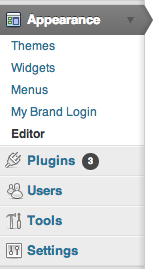 In addition, next to each user-input section includes support text. Next to the email address includes this text - Please enter an email address that you check regularly so that we can send you order-related communications, including shipment notifications and tracking numbers. We are committed to your privacy and never sell or share customer email addresses with outside companies or organizations. This level of reassurance is rarely seen and often under appreciated. If I were to guess, the Urban Girl checkout page has a lower-than-average exit/abandonment rate. There was only one shipping option available, however. Would have liked to order my products next day air but did not have the option. Facebook account is active and healthy. Pinterest account is setup and included some collections. Very active Twitter account showed they are promoting their business, but are also social activists for business equality. Can’t we all get behind this! Contact details are buried in the footer. I generalize when I see this. I think Urban Girl is afraid of phone calls or has not embraced some good phone technology. The contact page has a simple form, and the phone number is just part of the paragraph on how to contact Urban Girl. Why not put that phone number in the header of every page? 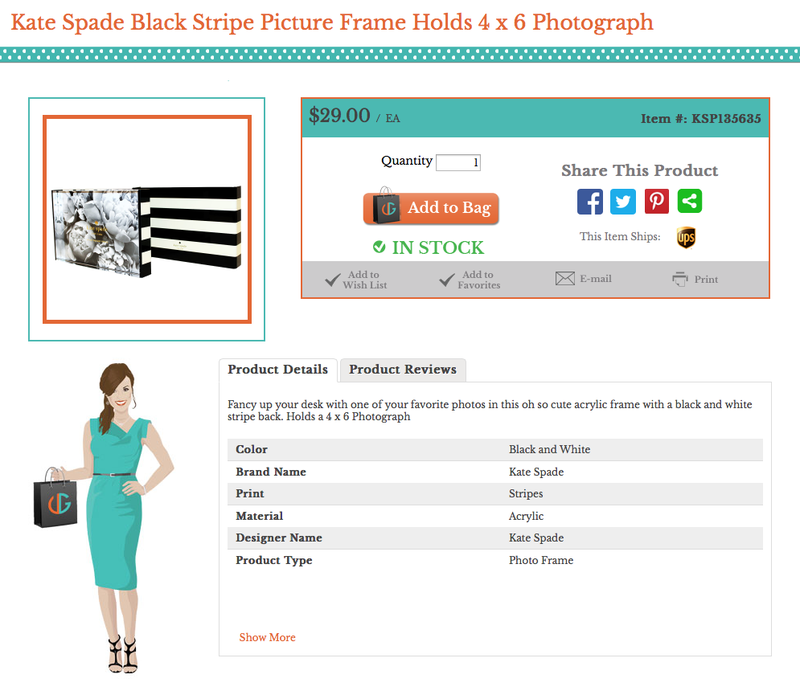 Shop-by categories are images and need to be a dynamic product grid. As badass as Google is, they still cannot read the text on the image and make any sense of what it is. Why not spoon-feed Google instead? Want to learn about what UrbanGirl.com is running on their site? Check out their BuiltWith details. Checking the advanced details at BuiltWith shows they’ve added some new functionality this year. Telerik Controls, ASP.NET 4.0, Convert Global, BV Commerce, LogicBlock 7Cart, and Papaya CMS appeared to be added in 2014. This is a positive sign and shows they are working on the site trying to improve the experience for customers. Install Google Trusted Stores and save money over paying Trust Pilot - Get the same “Trust Pilot” reviews for free with GTS. Update your landing pages with real html content - ditch the image maps. URL-Based promo codes - ditch the promo box. Checkout RingCentral.com for your phone needs and supercharge your customer service. Look at adding structured data to your product page and entire site. Perspective - Women business owners and shoppers think differently. Design - Women are visual but the basic checkout cues are still required. Layout - Active category pages are usable and cool. Try them on your site. 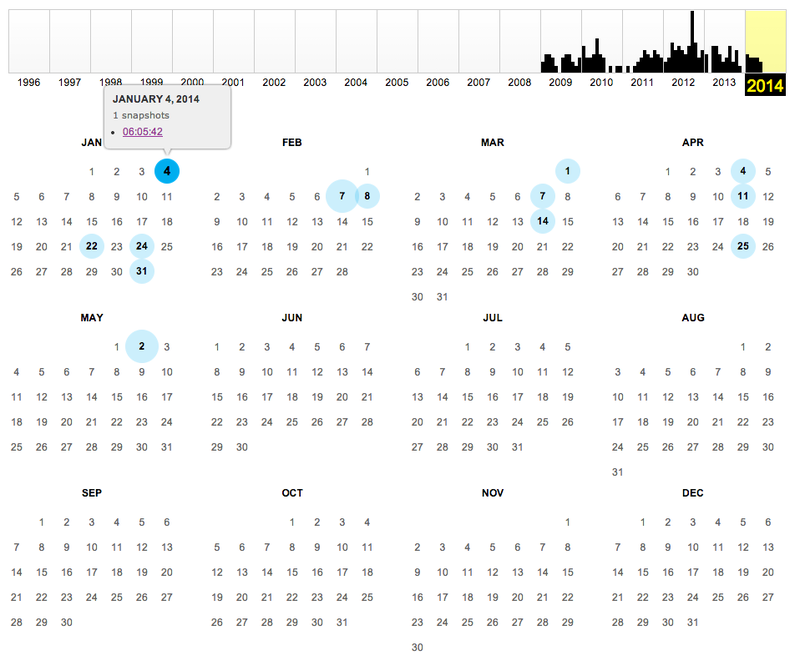 Update a WordPress site with awesome, dynamic Google Chart. Dynamically host the data so that anyone who has access to Google Spreadsheets can make changes. Go to the Appearance tab on the left hand side, then select Editor. 2. On the right hand side of the page, select the header template. Wordpress templates navigation on the Appearance > Editor page in wp-admin. 4. Click the "Update File" button. 5. Now, select "Pages" from the left-side navigation. 6. Click "Add New" under Pages. 7. Name the page something meaningful as this is a test. 8. Above the page edit toolbar is a "Visual" and "HTML"" tab - click the "HTML" tab. 9. Add the following code to the text box. 11. Open a new tab in your browser and navigate to your Google Drive/Docs account. 12. Once there, create a new spreadsheet. 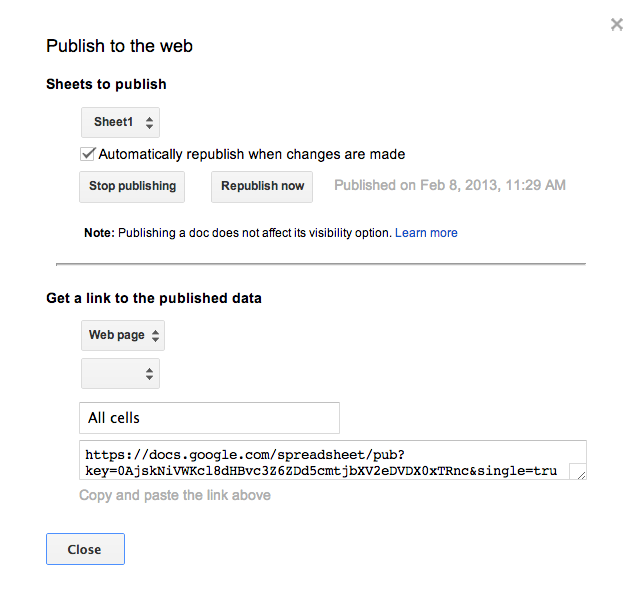 Google Drive / Docs create new document page element. 16. In column B, goto row 2 and begin entering corresponding number of hours spent per activity. 17. Your Google Spreadsheet could look like the following. Google Spreadsheet example showing two columns with titles and data. 18. Now, click File > Publish To The Web, and you should see the following. Google Spreadsheets publish options page element. 19. Select the name of the sheet you need to publish. 20. Make sure the automatically republish when changes are made (every 5 minutes). 21. Copy and paste the entire link from the last text box to notepad - see below. 23. Go back to the tab opened previously in wp-admin, and find the spreadsheet key in the code and replace it with the one in your clipboard. It’s underlined in red in the image below. Wordpress HTML view on the New Page screen in wp-admin. 24. Click the "Save Draft" button, then click the "Preview" button. Sample Google Pie Chart updated with Google Spreadsheet data. 25. Go back into the Google Spreadsheet and rename the tab from Sheet1 to Daily Activities. 27. Go back into your Wordpress page from step 24 and refresh the page.